Following on the heels of Toho’s newest Godzilla film, and a new Ultraman film, the friend to all children(?) is also returning, bringing with him a bit of the badass that showed up in the 90s trilogy. Not sure h0w much text I’m supposed to put here, but I couldn’t let this one go without sharing it here. There’s a new trailer online today for Harbinger Down, a scifi/horror movie from ADI, the studio originally tasked to create the creature effects for the 2011 version of The Thing. 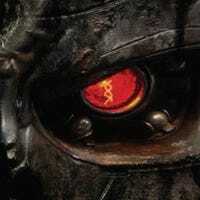 Jim Cameron talks about Terminator Genisys! Plus lots of new footage from the film! Spoilers in the video, be advised. First clips from Terminator Genisys! All this has happened before . . . I remember watching an episode of Lois and Clark when I was a kid. Unsubstantiated rumors, spoilers, and speculation ahoy! Seriously. Disguised as a marketing short for a robotics company, Neil Blomkamp's 2004 film asks the question, "What if you could supplement your police force with machines? Would it make your community safer?" Regarding the latest batch of Terminator Genisys rumors . . . I'm sort of on board with at least some elements of this.